CDs have taken over the consumer music marketplace. These small circular plastic and metal disks along with their brothers from the film industry, DVDs (digital video discs), have been common in our homes for the past decade, alongside or replacing vinyl records and cassette tapes. CDs can contain a lot of information and are light and highly portable. While downloading music from the Internet straight to an MP3 player is becoming more and more common, millions of CDs are still being sold worldwide, and this is an issue that anyone concerned about the environment needs to deal with. 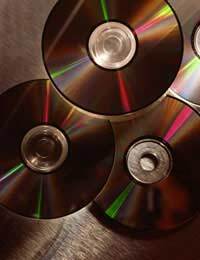 Keeping CDs out of Landfill: What can be done with Them? It has been estimated that around 2,500 tonnes of unwanted CDs are being thrown away every year – a substantial portion of the waste being sent to the landfill. Recordable CDs – which are sold on the high street to record music, video and data onto - have up to 20 milligrams of recoverable gold within them, which is worth a lot to those who can process the discs and accumulate enough material. Some processors can also remove the very thin data layer – the white or silver layer that the information is burned onto - and reuse the plastic disc. There are now a number of recyclers and re-processors in the UK who will accept your used CDs.A quick search online will produce half a dozen addresses for these businesses. Some of them operate collection services for businesses: you could organise work colleagues, for example, to bring in used or unwanted CDs on a regular basis, set up a collection box in the canteen, and these companies will come and pick up the box on a regular basis. Individuals can send small numbers of CDs into these companies themselves. If they don't have the facility to remove the gold from the CD, other recycling companies put the discs through a process which granulates, blends and compounds the material to make it into a high quality injection-moulding polycarbonate that has a variety of uses, including parts for the boxes for household burglar alarms, and lenses for traffic lights. If you are bored of your music collection on CD (or on vinyl for that matter), do donate it to your local high street charity shop. Many charity shops these days offer a good selection of music on CD, and would welcome yours too, if in good condition. The collection boxes provided by some of the bigger charities at other recycling facilities are an ideal place to deposit them, if this is more convenient than visiting a shop. Other more creative options include finding ways to reuse CDs around the house or in the garden.One simple way is to use them as coasters for cups and glasses, or underneath plant pots, to prevent surfaces from being scratched. Gardeners often tie a load of CDs together along a piece of string or washing line and hang them up to scare birds away from plants or vegetables! See if your local school has any art projects or ideas to reuse them – or suggest some yourself.Use the challenge of recycling to get creative! Hi, I am interested in buying cds and dvds from you. I am just wondering if you sell them at all if not can I get collect them from you please. Looking forward to hear from you.